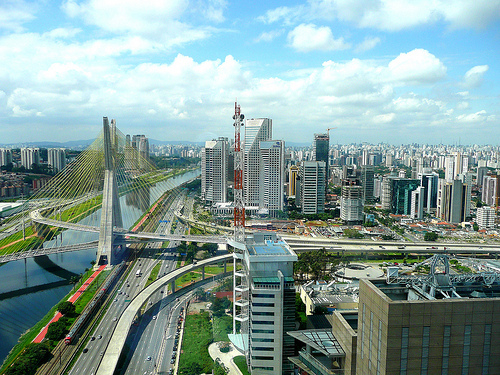 São Paulo is the name of both one of States of Brazil, and its respective capital. The city of Sao Paulo is the largest and richest in Brazil, and one of the largest in the World. With a booming Economy, Brazil is quickly becoming an important player in World Politics and Economy. And there is no doubt that Sao Paulo is the finance and business capital of Brazil. More and more businesses are setting offices in Sao Paulo; in 2011, more than 10 million foreign people visited the city - most for business purposes. This site is aimed at helping foreigners to conduct business in Sao Paulo. »Sao Paulo hotels. The State of São Paulo has the largest network of hotels in Brazil. »Restaurants in São Paulo. Centuries of peaceful miscigenation produced fabulous culinary results. »World Cup in Sao Paulo. The city will host important matches of the FIFA World Cup 2014. »Travel and tourism. Information for the foreign traveler visiting São Paulo. Also: The city of São Paulo - Stay Another Day. Tips for one-day tours around São Paulo. »Culture in and of São Paulo.